Learn how to conduct research and how to create Non-Fiction books for self publishing authors. 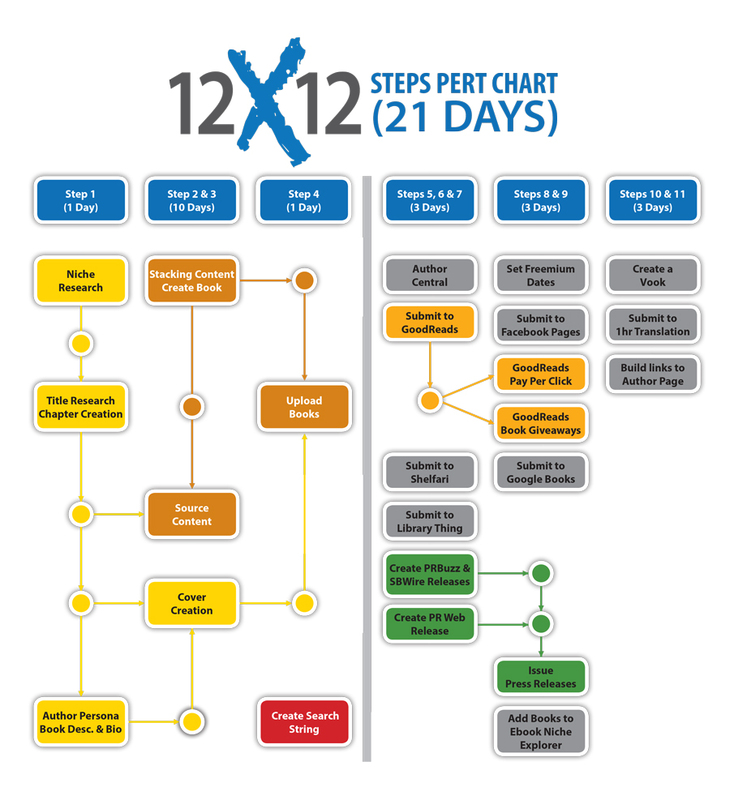 Follow the 12 x 12 step method of researching and writing fiction as an indie publisher. Learn how to create titles for your Non-Fiction books, fiction books and Children's books. Download the Title Creation Sheet as well. Learn why Content Asset Management is a critical part of the Publishing Business for Indie Authors. Being able to track content and to ensure that you use it wisely when stacking your articles is imperative to your success. Learn how to use the Jutoh Software which has replaced Speedy Book Publisher as the choice software to create eBooks, Kindle Mobi and even Smashwords documents. Let our designers blow you away with unique cover designs created just for you! Learn how to create author personas for your titles. This training is essential for both fiction and non fiction indie publishers. Learn how to source content for your books, learn why you need to have a specific type of Job Posting that will allow you to get the best possible writers to bid for your writing job. Stacking content is a method of using content that exists in books you already own to compile them to make an entirely new title. Example if you have a Paleo, Low Carb and even General Diet Recipe Book, you can extract all the Chicken recipes to make a Chicken Recipe Book. The concept goes deeper and we examine that in this lesson. Learn how to use cover templates. Follow this step by step guide on how to upload to Amazon Kindle Direct Publishing Platform. Print on demand is made easy using Amazon's Createspace service. Learn how to add your books to Createspace easily using this easy to follow Video Training. ACX is the premier source of adding your books to Audible.Com and Apple iTunes. Use this training to learn how to publish using this platform. Learn how to publish to Speedy Publishing Distribution using Title Distribution Manager. Learn how to get your books ranked in Amazon.Com. Learn how Amazon determines which eBooks to rank HIGHER within the listings for any keyword and which to rank lower. Learn how to improve your sales pages * Note that Amazon.Com has removed some of these features and few might not work currently. Goodreads is a free website for book lovers. Imagine it as a large library that you can wander through and see everyone's bookshelves, their reviews, and their ratings. Learn how to add your books to Goodreads to improve discoverability. This social media site is focused on books. Members can build virtual bookshelves, discover, rate and discuss books, and participate in online groups. Learn how to use this platform to drive readers to your books. LibraryThing is a social cataloging web application for storing and sharing book catalogs and various types of book metadata. It is used by authors, individuals, libraries, and publishers. Learn how to add your books to Library thing to generate reviews and find new readers for your titles. Get media attention. for your book. Get a press release prepared to shoot out and request for a review for your book. Learn how to use two great press release platforms to do this. PR News wire distributes to more than 200,000 media points and 10,000 Websites, offering the most ways to reach your audience online and off. You can generate substantial buzz about your books using this method. Freemium is a pricing strategy by which your titles are offered free of charge to get needed reviews and to generate buzz about your titles. Learn how to set you book up as a freemium. With more than 300 million pageviews and 45 million unique visitors a month, Goodreads offers advertisers integrated advertising and promotional programs to reach our highly affluent and educated audience of book readers. Learn how to take advantage of this social media site for book readers. When it comes to marketing a book, never underestimate the power of a book giveaway. Perhaps one of the best ways to kick start book discovery is by offering your book for free. Learn how to use the power of a Goodreads Giveaway to drive more sales of your books. Google Books Partner Program launched in Dec. 2010 as Google Editions, then became Google Ebooks, then got engulfed in the massive Android supermarket known as Google Play. This platform can allow you to sell a vast number of books, learn how to use it. There’s nothing like a fun and friendly competition to get people excited about your book. And there’s no better platform than Facebook to get things rolling. Learn how to use Facebook for Indie Authors. Press Release is an essential book promotion tool in any author’s publicity kit. A press release is the media industry’s standard communications document used to alert journalists and reviewers to a new book’s publication. Learn how to drive buzz using an Update Press Release. eBook Niche Explorer has a unique component that will allow users to track the Amazon Best Seller Rank of their books. Learn how to use this aspect of the software. Enhanced ebooks are essentially multimedia books. They are available on devices like iPad and Kindle Fire, which are designed for watching video and listening to audio. Learn how to add video to your eBooks. Have you thought about translating your book and getting it published in other languages? Then you need to watch this lesson on Translation. There are two great methods to get this done. This is one method. With more and more people using the internet everyday, it is essential for authors to have their own websites. An author website can serve as a dynamic tool to promote yourself; learn how to use Amazon's Author Page as a good start to the process. Issuing press releases is a mainstay of basic PR. It’s how you start the ball rolling with the press. The good news is, if approached in the right way whether you do it yourself or use an affordable professional, this activity will help promote your book. Learn how to issue a series of releases. As you begin thinking of ideas for your children’s book, it’s very helpful to read others’ work. Go to your library or children’s bookstore and spend a few hours browsing, use the process outlined in this video to create much more successful books. Get the tools that you will need to bridge the gap between a much a single book author to a full hybrid author or small publisher with the ability to push content easily to a global market. Get eBook Niche Explorer The best niche research software currently on the market. Niche reports allow authors to download the best publishing niches.